Savannah houses the nation`s most valuable living collection of 18th and 19th century architecture. Founded by General James Oglethorpe in 1733, Georgia`s colonial capital now encompasses six Historic Neighborhoods and each Spring Savannahians open their doors to visitors during the Savannah Tour of Homes and Gardens. Take a Tour of Savannah�s historic district on a Segway! You and your group will be shown Savannah�s rich and unique history in a very unique way. Our knowledgeable tour guides are Certified by the City of Savannah. We also have Segway Rentals for those who want to see Savannah at their own pace. Visit our website for all the details! Many tours including Paula`s "Rags to Riches" Story will both inspire and entertain you. Join us for this exclusive tour which includes lunch at Uncle Bubba`s Oyster House. Come join us for a peek into the life of famous southern cooking entrepreneur, Paula Deen. Visit a few of the shops that Paula frequented, and still showcases, on her way to establishing one of Savannah`s most popular restaurants. We are the premiere walking tour for Haunted Savannah - the second most haunted city in the US according to the History Channel, and number one as ranked by the Parapsychologists of America! Contact Greg Proffit to schedule your ghost walk. See Savannah the eco-friendly way via our sixteen pedal, Savannah Pub Pedal Ride. Book your batchelor or bacheloreet party on group tours of Savannah for as little as $10 per hour per rider. Tours depart and return from the Crystal Beer Parlor at the corner of Jones Street and Jiefferson Street. See the sights, hear the history and visit the charming city squares on our comprehensive 90-minute tour of Georgia`s First City. Whether you choose the express option or take advantage of all day on and off privileges at any of our 14 stops, you can be sure you`ll "see the best first!" Highlights include: City Market, Forsyth Park, the Mercer House, Colonial Park Cemetery and the world famous River Street. 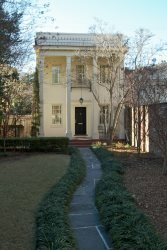 Daily Tours of the Andrew Lowe House can be taken daily at our Lafayette Square Museum and one time home of Juliette Gordon Low, founder of the Girl Scouts of American in Savannah, Georgia. A graduate from the Savannah College of Art and Design takes you on a knowledgeable walking tour of the Historic District from an architect�s vantage point. For over 30 years now, Carriage Tours of Savannah was the city`s first carriage tour company, and has been featured in magazines, guide books and videos. In years gone by, when traveler`s encountered Savannah, their first experience was walking upon cobblestones as they disembarked their vessels on River Street. In honor of this past, Cobblestone Tours would like to be your first experience while visiting Savannah, one of the most beautiful cities in America. Our fully-costumed guides enjoy a reputation of providing informative and historically accurate walking tours. Check out our Haunted Club & Pub Crawl of City Market. 6th Sense World to date, offers more specialty ghost, cemetery and ghost hunt styled tours in one city than any other company operating in the USA. More than just cashing in on an industry, 6th Sense World started in 1995 as a personal quest by founder Shannon Scott to more fully offer visitors an opportunity to go as deep with the place as possible! Most cities offering ghost & cemetery tours are, pardoning the expression, one horse ghost tour towns More research, more qualified narrators, longer & more in depth tours and more to remember and escalate your desire to open more of Savannah`s strangest rooms with all of our tours! Destination Management Receptive + Group Tours! For multi-day complete packages or just a step-on guide, our "on the spot" attention to detail assures carefree and confident traveling. Our personalized and creative planning will fit your budget but always provide superior quality and unique options. Great meals, lively tours, engaging entertainment -- not just a tour but a delightful experience. Native Savannahian Diane Brannen has been involved in the carriage tour business in Savannah for 27+ years, having applied her extensive knowledge of horses and riders to train hundreds of drivers for her businesses during that time. This is her fifth carriage tour company during that time. She has supplied horses, carriages, and riders for many memorable movies including North and South, Forest Gump, and Glory to name a few. At Kelly Tours, we handle a lot of touring options within the coastal empire but our main claim to fame is we specialize in hosting Girl Scout troops when they visit the birthplace of the movement, the home of Juliette Gordon Low. She held the first Girl Scout troop meeting at this place in historic downtown Savannah. And no one knows Savannah like Kelly Tours, it`s our home town! Personalized tours of Savannah`s historic district can be customized to particular party and needs. Contact our reservation desk to learn more. Hear the history of Savannah in the language of the South. Savannah Dan will tell you the inside story about the shooting death of Danny Hansford of Midnight in the Garden of Good & Evil fame and much, much more. Hear of Savannah�s rich history as we roll along historic streets showing you a wide variety of tree lined squares, beautifully landscaped private gardens, and historic architecture. As reported in the New York Times, one of Savannah�s finest architectural walking tour in the heart of the historic district. Discover Historic Savannah A Saunter in Savannah is the best proof walking is the most delightful way to discover this oak-shaded coastal city rich with history. Allow our guides to take you on a trip through Savannah`s past with emphasis on the architecture and ironwork visible today. Meet the important characters in Savannah`s history. Discover the squares of Bull Street: "The jewels in the crown of Oglethorpe`s plan. Savannah Walks tour special offers you 3 of our most popular walking tours for one low price! During your stay, take any of our two day tours* (for example: our Savannah Stroll and our Civil War Tour) and our ever popular evening Ghost Tour, all for just $30. For just a little more than the price of one trolley tour, you can take three in-depth and entertaining tours of Savannah, seeing our wonderful city as it was meant to be seen. Come through the iron gates and beyond the old gray brick walls to enjoy the hidden garden pleasures beneath hundred-year-old oaks. Hostesses at each garden greet visitors and point out special plants, garden features, and interesting historical facts. Sparkling fountains, delightful statues, and the brilliant blooms of Savannah`s lovely springtime are treasures to be found in the manicured gardens.